Pak. J. Bot., 43(1): 419-425, 2011. 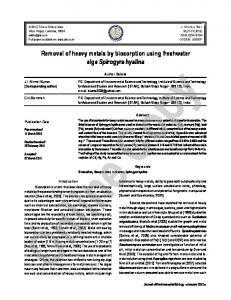 BIOSORPTION OF HEAVY METALS BY PRETREATED BIOMASS OF ASPERGILLUS NIGER AMNA JAVAID*, RUKHSANA BAJWA AND TARIQ MANZOOR Institute of Plant Pathology, University of the Punjab, Quaid-e-Azam Campus, Lahore-54590, Pakistan. *Corresponding author E-mail: [email protected] Abstract The present study reports the biosorption potential of chemically pretreated mycelial biomass of fungus Aspergillus niger van. Tieghem for Cu(II) and Ni(II) ions from aqueous phase. Fungal biomass was pretreated with different types of alkaline/salts (NaOH, NaHCO3, Na2CO3, NaCl & CaCl2,), acids (HCl & H2SO4) and detergent. Pretreatment of biomass with Na2CO3 and NaOH were proved to increase or maintain adsorption efficiency and capacity in comparison to untreated biomass. Pretreatment with NaHCO3, detergent, NaCl and CaCl2 significantly reduce (10-40%) metal sequestering efficiency of the adsorbent. 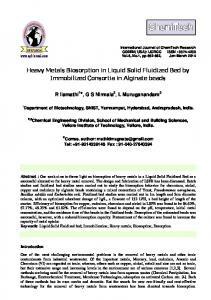 Whereas, acid treatments resulted in drastic loss (80%) in metal uptake efficiency of the biomass. Amongst various pretreatments, Na2CO3 could be use efficiently for the removal of Ni(II) and Cu(II) ions from aqueous solution using A. niger. Introduction The increasing trends towards artificial high life standards are compelling the people towards misuse of resources resulting in environmental degradation at massive scale. Incidentally, increased industrialization has affected the environment through disposal of waste containing toxic contaminants in the form of metals. The situation is getting more alarming in last two decades in many big cities of Pakistan (Qaiser et al., 2007), where industrial units are established without environmental impact assessment and planning. Amongst 6634 registered industries in Pakistan, 1228 are considered to be highly polluting (Sial et al., 2006), which dump their solid and liquid wastes into sewers, nullahs and streams, that are mixed with groundwater raising levels of heavy metals and other contaminants (Gulfraz et al., 2002). Therefore discharge of heavy metals, their accumulation and contamination has become an environmental, health, economic, and planning issue in Pakistan (Hussain et al., 1996). 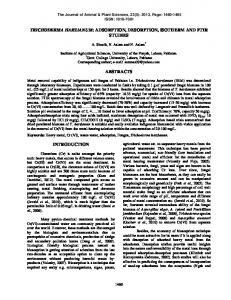 Biological methods of metals removal from aqueous solution, known as biosorption, have been recommended as cheaper and more effective technique (Artola et al., 1997) at a meeting in 1993 organized by the Solvent Engineering Extraction and Ion Exchange Group of the Society of Chemical Industry at UK (Apel & Troma, 1993). 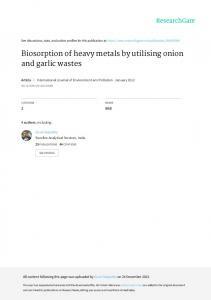 To date, research in the area of biosorption suggests it to be an ideal alternative for decontamination of metal containing effluents (Gupta et al., 2000). Generally speaking, the biosorption takes place by both living and non-living microbial biomass, but there are differences in the efficiency and mechanisms involved (Park et al., 2005). The efficiency by which dead cells act as sorbent of metal ion may be greater than that of living cell and confirm its wider acceptability. This is due to the argument that dead cells do not have toxicity limitations, no requirement of growth and nutrient media, storage property for extended time period and easy desorption of adsorbed metal ions (Awofolu et al., 2006). Various physical (heat treatment, autoclaving, freeze drying, and boiling) and chemical (acids, alkali and organic chemicals) pretreatment protocols have been developed to convert the viable cells into nonviable (dead) (Loukidou et al., 2003; Cabuk et al., 2005). According to many workers, the chemical pretreatment methods may provide better results in the list of number of pretreatment protocols owing to change in cell wall chemistry of the biosorbent (introduction of various important chemical groups) (Kapoor et al., 1999). 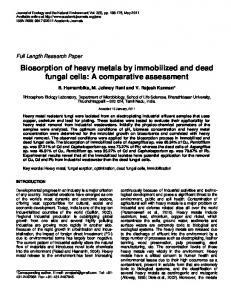 Yan & Virarrghavan (2000) have reported that alkaline (caustic) treatment could enhance metal binding by biomass. The alkaline treatments, including sodium hydroxide, potassium hydroxide, alkaline detergents or other alkaline reagents ruptures the ce11 walls of the microbes and exposes additional functional groups for metal ion binding. The residual alkalinity may result in the hydrolysis of certain metals, thus enhancing the biosorption capacity of biomass (Brierley, 1990). According to Huang & Huang (1996) acid-washing process have better results over other treatments as this treatment may dissolve polysaccharide components in the outer cell wall layer of the biosorbent, thus producing additional binding sites. It is obvious that many different and challenging contributions have been made on the path to develop biosorption from a scientific curiosity to useful applications. However, effect of chemical pretreatments is the important parameters for the successful application of biosorption by the biosorbent. Therefore, current investigation was designed to investigate the biosorption potential of pretreated biomass of Aspergillus niger for removal of Cu(II) and Ni(II) from aqueous solution. Materials and Methods Biomass production of test fungal species: The pure cultures of A. niger (FCBP 787) was obtained from First Fungal Culture Bank of Pakistan, Institute Plant Pathology, Punjab University Lahore, Pakistan. Mycelial biomass of test fungus was grown in pre autoclaved liquid medium (2% ME, 20 g malt extract/1000 L), incubated for 6-7 days under controlled temperature of 25 ± 1oC at 150 rpm. Fungal biomass was harvested by filtration and subjected to successive washings with double distilled deionized water with finality of the culture broth removal. Pretreatments of biomass: Harvested biomass was subjected to different chemical treatments. The acid and base of different normailities were used for pretreatments (Table 1). In each pretreatment, the biomass was slowly stirred in the chemical solution for a certain period of time. After each pretreatment biomass was washed with double distilled waster till pH of the washing solution reached a neutral range (6.8-7.2). Finally pretreated biomass was dried in an oven at 60 ± 1oC for 24 hours and homogenized in blender to break cell aggregates into smaller fragments. The biomass was then passed through 50 µm mesh sieve of to obtain particle sizes of less than 0.5-1mm diameter. The dried biomass was preserved in airtight jar to be used in biosorption tests. Simple oven dried biomass was also utilized in biosorption test experiments to assess and compare the potency with chemically pretreated biomass. Fig. 1. 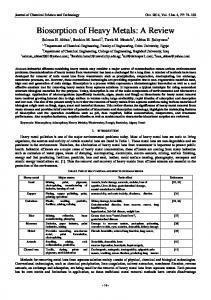 Effect of pretreatments on removal of Cu(II) ions by A. niger. Fig. 2. Effect of pretreatments on removal of Ni(II) ions by A. niger. Pretreatments: 1: NaOH (0.2N), 2: NaOH (0.5N), 3: Na2CO3 (0.2N), 4: NaHCO3 (0.2N), 5: NaCl (0.2N), 6: NaCl (0.5N), 7: Detergent (2.5g), 8: CaCl2 (1%), 9: H2SO4 (0.05N), 10: HCl (0.1N), 11: Untreated biomass (UB) Value with different letters at their top show significant difference (P ≤ 0.05) as determined by Duncan’s Multiple Range Test (Steel and Torrie, 1980). aqueous solution. Assessments revealed that the fungal biomass exposed to alkaline supplements/salts exhibited significantly higher and parallel biosorption efficiency in comparison to untreated biomass. Whereas most of the pretreatments induced reduction in uptake efficiency and capacity of the adsorbents as compared to control (untreated biomass). It was previously observed that dried biomass generally acts as ion exchange resins and its biosorbing capacity depends on the available charges on the cell surface that bind to the biosorbent metal ions. 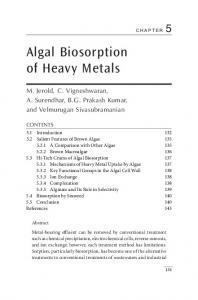 Whereas, physical and chemical treatments can be use to enhance the metal uptake capacity of the biomass, which led to removal, hiding or exposing chemical groups that binding or exchange with the adsorbed metal ions (Saleh et al., 2009). In current research work, an increase in biosorption of Cu(II) and Ni(II) ions was noticed as a result of alkali pretreatments particularly Na2CO3 and NaOH. Similar enhancement in metal uptake capacity of the fungal biomass regarding alkali pretreatment was recorded by Yan & Viraraghavan (2000), El-sayad & El-Morsey (2004) and Das et al. (2007). It could be due to chemical modifications of the cell wall components. The modification of biomass probably destroys autolytic enzymes that cause putrification of biomass and remove lipids and proteins that mask the reactive sites (Muraleedharan & Venkobachar 1990). On the contrary, Kapoor and Viraraghavan (1998) reported 45% decline in adsorption of Ni(II) ions due to treatment with NaOH. 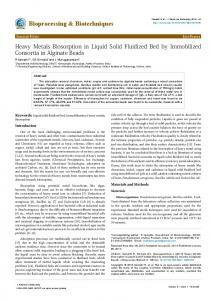 They stated that deproteination should theoretically reduce metal retention. Reduction in adsorption efficiency and capacity of adsorbent due to rest of alkaline/salts treatment (NaHCO3, detergent, NaCl and CaCl2) could be results of more affinity of active chemical groups viz., HCO-3, HSO-4 & Cl- ions to the cell wall components of the adsorbent. Presently the recorded reduction in sorption capacity of test fungus for metal ions was evidenced due to acid pretreatment. The assessments seemingly are in agreement with observations recorded in the case of A. niger (Kapoor and Viraraghavan 1998) and Mucor rouxii (Yan & Viraraghavan 2000) and A. fumigatus (Saleh et al., 2009). It could possibly be explained in terms of H+ ions binding to the biomass after acid treatment being responsible for the reduction in adsorption of heavy metals. This indicated that the acids destroyed the absorbing groups and their positive ions(H+) may covalently bonded to the absorbing surfaces. Bux & Kasan (1994) have suggested that the higher the biomass electronegativity the greater would be the attraction and adsorption of heavy metal cations. Thus, the remaining H+ ions on the acid pretreated biomass may change the biomass electronegativity, resulting in a reduction in bioadsorption capacity. 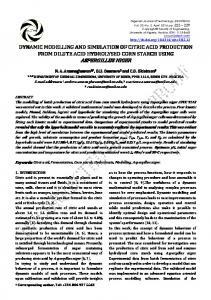 In contrast to that Huang & Huang (1996) have reported that acid pretreatment can strongly enhance the adsorption capacity of Aspergillus oryzae mycelia. The controversies in results after a specific pretreatment may be attributed to the different strains of fungi used and whether the biomass was live or dead when it is used in biosorption of metal ions. Conclusion The present study concludes that chemically pretreated mycelial biomass of A. niger exhibited greater, same or less adsorption capacity and efficiency than that of untreated biomass, depending on the pretreatment. The biomass of fungus could be effectively utilized to remove Cu(II) and Ni(II) by pre treating it with Na2CO3.